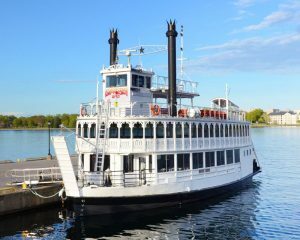 Kingston 1000 Islands Cruises offers the widest variety of cruises in the 1000 Islands including sightseeing, lunch, and dinner cruises, as well as private special events departing from historic downtown Kingston. Our fleet includes three vessels over 60 tons: the Island Belle, the Island Queen and the Island Star. Kingston 1000 Islands Cruises is part of Kingston Destination Group, a group of brands focused on achieving hospitality excellence as the portal to inspired visitor experience in the Kingston 1000 Islands destination. Joining our team as a member of the marine crew means committing to an engaging, rewarding career in the heart of Kingston’s busy and expanding tourism industry. Marine crew members are directly responsible for the safe operation of their vessel, and also for interacting with guests and contributing to the welcoming atmosphere that encourages tens of thousands of guests to visit us every year. Seasonal operations run from April to October. Marine Officers: Kingston 1000 Islands Cruises is seeking Marine personnel with Transport Canada Mate or Master certifications, holding a Mate or Master Ltd over 60 Tons or higher certification. The ideal candidate will be an experienced vessel operator interested in working in a customer-service focused environment. Marine Trainee: There are tremendous career opportunities in Kingston’s local and regional marine industry. Kingston 1000 Islands Cruises has annual trainee positions leading to Marine Certification and great summer jobs while in post secondary studies. Successful applicants are eligible for annual post-secondary tuition scholarships. Some nautical experience is ideal.